ISTANBUL (Reuters) - Unzile Aksakoglu struggles to explain to her seven-year-old daughter why her father Yigit has spent four months in jail and may never leave, because of his alleged role in mass protests against Turkey's government when she was just a year old. 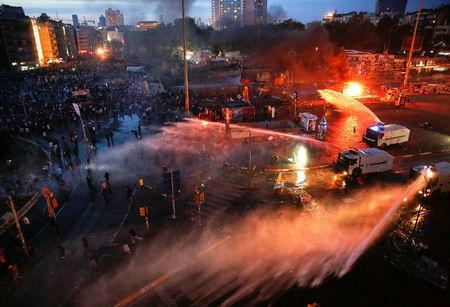 After all, the people originally prosecuted over the 2013 protests - which began against the redevelopment of central Istanbul's Gezi Park and grew into nationwide anti-government unrest - were acquitted. A Turkish judge ruled in 2015 that the protesters were exercising the right of freedom of assembly in what turned out to be the biggest popular challenge to Tayyip Erdogan's rule. But in November, Yigit Aksakoglu was detained and is now facing trial with 15 other civil society figures, writers and actors. For a while Aksakoglu's family hoped he would soon be released, but then on March 4, a 657-page indictment was released saying they had masterminded an attempt to overthrow Erdogan's government. "I say to her, 'I promise I and your daddy's friends will get him out. Don't worry. This misunderstanding will end.' But a part of me is really scared," Unzile said. Supporters of the detainees say the indictment contains no evidence and many bizarre accusations, and marks a new low for a country where 77,000 people already been jailed in a crackdown following a failed military coup in 2016. The European Union said that by seeking life sentences, prosecutors were creating a climate of fear in Turkey, while the U.S. State Department has said Washington is gravely concerned. The arrests are the latest step in a crackdown which Turkey says is a necessary response to security threats that the country faces and which has involved widespread purges in the armed forces, ministries and state organisations. In the summer of 2013, hundreds of thousands marched in Istanbul and across Turkey to protest against plans to build replica Ottoman barracks on Gezi Park by Istanbul's Taksim Square, chanting "everywhere is Taksim, everywhere is resistance". Eight young protesters and a police officer were killed in the unrest and 5,000 injured. The indictment, formally accepted by an Istanbul court on March 4, says hundreds of properties were damaged in the protests. It also includes assertions that rights groups have dismissed as fanciful conspiracies. It says the protests were organised by local extensions of "forces which control global capital", singling out billionaire philanthropist George Soros. Erdogan has vilified Soros as "the famous Hungarian Jew ... who assigns people to divide nations". The indictment says the "Gezi Uprising" was fuelled by Osman Kavala, a well-known civil society leader and businessman who has been in jail since October 2017. A picture from Kavala's phone taken from an academic book showing how different types of bees are distributed across the Middle East was described in the indictment as showing Turkey's borders violated and redrawn. It said the fact that defendants discussed bringing milk, juice and pastries to Gezi, as well as gasmasks to counter the effects of tear gas, showed they were financing the protests. The Taksim Solidarity group, which includes some of the 16 defendants, poured scorn on the indictment, saying it portrayed the handing out of flowers to police and the provision of sandwiches to protesters as signs of guilt. The demonstrations, the indictment says, were inspired by the worldwide "Occupy" protests and Arab uprisings starting in 2011 and a book by Boston-based academic Gene Sharp called 'From Dictatorship to Democracy'. The indictment cites Gezi protest acts that matched Sharp's non-violent protest methods, such as Roger Waters' "The Wall" concert in Istanbul in August 2013 when photos of people killed in the protests were displayed on a huge stage backdrop. Amnesty International Turkey representative Andrew Gardner described the case as "an attempt to rewrite history" and said the request for life sentences without parole represented a "massive escalation" in Turkey's crackdown on civil society. "What we are facing is an existential crisis for independent civil society in Turkey," he said. "It is a blatant attempt to scare and pursue critics on completely trumped-up, fanciful conspiracy theories." Erdogan equates the Gezi protesters with Kurdish militants and those accused of carrying out a failed coup in 2016. In campaigning for March 31 local elections he has often accused opposition parties of being allied with militants. The protests began to prevent the redevelopment of a park in a city with limited green space, but Erdogan dismissed the idea of environmental motivation, saying: "Those who planned and financed the Gezi events, tried to overthrow the government using 12 trees as an excuse are giving account to the judiciary. "No one in Turkey gets away with crimes they committed any more," the president said in a speech last week. Aksakoglu, who works for a Dutch foundation which supports young children's development, was interrogated for 11 hours after he was detained in November. The specific charges against him say he was involved in organising meetings to prepare civil disobedience. When first jailed he angrily paced around his cell in prison west of Istanbul, wondering why he had been charged, his wife Unzile said. She said his anger flared up again after reading the indictment. Unzile said her husband is a social scientist rather than an activist and never met Kavala. The indictment said he had been in contact with someone who had. Kavala himself is accused of spreading protests through his organization Anadolu Kultur, which promotes culture and rights. Osman Kavala's lawyer Ilkan Koyuncu said it was hard to see what his client was actually accused of, and the contents of the indictment offered no evidence to support the charges. "You hold these people responsible for all the windows that were broken in June 2013... but provide no evidence. This is not something that can be done legally," he said. Then-prime minister Erdogan and his cabinet of the time are all plaintiffs in the case and the indictment names 746 people as injured parties in the nationwide protests, holding the defendants responsible for all injuries and damage to property, such as smashed windows. Istanbul Bilgi University law professor Yaman Akdeniz said the indictment lacked legal detail and reasoning, with only 1-1/2 pages of legal issues in the 657-page document. "Basically, it is shambolic and if it was written by one of my law students, he or she would get a clear F mark," he said. Aksakoglu's lawyer Asli Kazan said the indictment relied on wiretaps from the second half of 2013, after the Gezi protests. She said that investigation was originally launched by prosecutor Muammer Akkas, himself now a fugitive accused of membership of what Ankara terms a terrorist group led by U.S.-based Muslim cleric Fethullah Gulen, which Ankara blames for the failed 2016 coup. His long-shelved investigation was taken up again around 2016, when the current case was opened, the lawyer said. Addressing this issue, the prosecutor said in the indictment that though suspects claimed the investigation was directed by "armed terrorist organization militants", their influence on the case file had been removed by a re-evaluation of all the evidence and wiretaps after 2016.